As part of Nua’s Outreach programme, some of our Service Users participate in the annual Job Shadow initiative by the Irish Association of Supported Employment. Job Shadow Day is a national day of awareness to promote equal employment opportunities for people with disabilities. In April 2017, Nua Service Users had another fantastic opportunity to gain real on-the-ground experience in areas they may wish to work in, in the future. Since the Job Shadow initiative commenced in 2008, it has been hugely beneficial to our Service Users, not only in their overall development and confidence in the workplace, but it has also been very successful by supporting their integration with many of their local communities and helping them to move closer to achieving their overall goals. This year, six Service Users in particular spent their job shadowing experiences in an array of workplaces such as; The Odeon Cinema in Newbridge, Spar in Newbridge, Cahill Cycles in Naas, Fresh Today in Athboy, Red Lane Golf Club also in Newbridge and finally, the Talbot Hotel’s 'The Dome' in Carlow, a family entertainment centre offering bowling and a congo quest jungle experience. Service User, Lauren, travelled to 'The Dome', Talbot Hotel in Carlow, for her job shadow experience and whilst there, she was supported and shadowed by The Dome’s member of staff, Amanda. Amanda was a fantastic mentor for Lauren as she supported and encouraged her throughout the day. After Lauren’s Job Shadow experience, she reflected on her experience with staff and it was reported that she really enjoyed herself and she was already on her way to becoming an expert coffee maker! Lauren is now thinking of studying to become a qualified barista. To put an even better finish to the day, Lauren was thrilled and very proud to be presented with her very own staff uniform from Amanda. Well done to Lauren and special thanks to all the staff at the Dome in Carlow for making this day happen, and thanks to everyone else who helped facilitate this fantastic day. 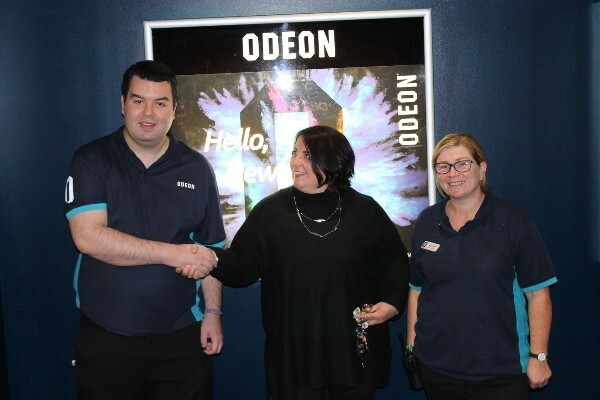 Another Service User, Jake, loved his experience in The Odeon Cinema, Newbridge. Looking very professional in his uniform, Jake was happy to clean display screens, perform a stocktake of popcorn supplies, and provide great support to his colleagues. Pamela, the manager of the cinema, said he was a great team member and an excellent worker. Nua Healthcare would like to sincerely thank Pamela & all the staff at The Odeon Cinema, Newbridge, for their continued support & their participation in Job Shadow Day 2017. Well done to Jake and indeed to all our other job shadow participants.